Swing weight affects how the club feels during your swing. If you are looking to improve your golf game then you should think about calculating your golf swing weight. It is important to match your natural swing speed with the swing weight of a club to get the best results when you are on the course. By being able to use clubs with a swing weight that matches your natural swing speed, you will be able to get the most accurate swing. Place a pivot point on a flat surface. A pivot point is a triangle-shaped gauge that is used for measuring by employing gravity to balance an object on top of the pivot point. 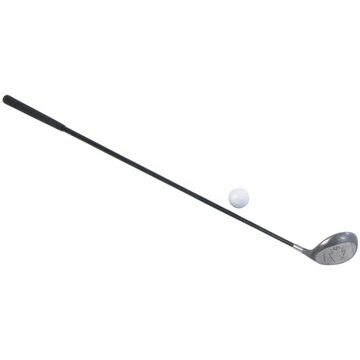 Pick up your club and place it horizontally on the pivot point until it balances. Use a tape measure to measure the shaft from the place where it is balancing on the pivot point to the end of the grip, which would be the top of the club. Record this number in inches, millimeters or centimeters. Weigh the club on a postal scale. It is important that the scale is as accurate as possible, so you may want to test it first. The weight will likely be in ounces and you will need to convert it to grams. One ounce equals 28.3495231 grams. You can use a calculator to get the amount in grams or you can use an online ounces-to-grams converter (see Resources). Go to the Leaderboard.com website (see Resources) and use the Swing Weight Estimator calculator. You will enter the measurement you took from the pivot point to the end of the grip in Step 1. From Step 2, you will enter the weight of the club in grams. When all numbers are entered, click on “Calculate” to get your golf swing weight.